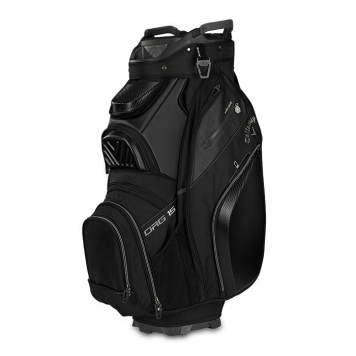 The Org 15 offers more features than before, making it the Ultimate Premium Cart bag. The 15 Way top with full length dividers, has been redesigned to sit parallel to the ground, allowing club grips to sit flush in the bag. A TPE lined putter well keeps putter shaft from scratching. Front facing magnetic range finder and sunglass/media pockets feature molded Carbon Fiber PU, for extra protection. Two side accessory pockets were molded to keep items secure and easily wipe clean. The Org 15 has an endless supply of storage with 14 Pockets and is wrapped in durable yet stylish fabric.